John Chapter One records how Jesus called disciples to follow him. Verses 43 to 51 tell the remarkable story of how Nathanael became a follower. Remarkable, because on the face of it, his response seems improbable. 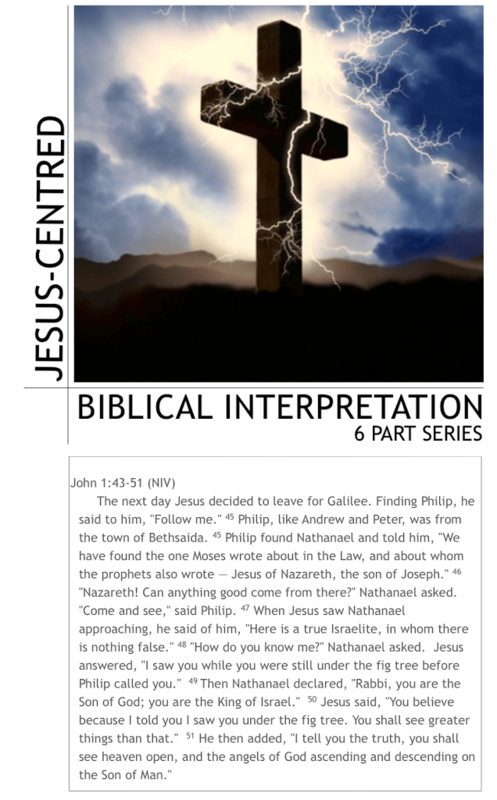 Phillip brings Nathanael to Jesus; Jesus makes one statement to him; Nathanael immediately declares Jesus to be the Son of God and King of Israel. Now why would the man have reacted like that? Let’s explore this question just a little. Nathanael was most likely a student of the scriptures because when Phillip approached him he used words that would appeal to a scholar. He could have said, “We have discovered a remarkable miracle worker”, or “We have come across an amazing healer”; but he didn’t. Instead he declared, “We have found the one Moses wrote about in the Law, and about whom the prophets also wrote – Jesus of Nazareth, the son of Joseph.” The phrase ‘Law and the Prophets’ was often used as shorthand for the full body of scriptures we now know as the Old Testament. Phillip’s declaration would certainly have attracted the interest of a scholar. At first Nathanael reacted sceptically with, “Nazareth! Can anything good come from there?”, but then he accepted Phillips invitation to “Come and see”. As he was approaching Jesus the Lord indicated that he had insight into Nathanael’s character and this prompted the challenge, “How do you know me?” Jesus’ response was short and cryptic but it solicited a surprising reaction. It was surprising, because Jesus did not appear to say anything that should have invited such a passionate declaration from the sceptical scholar. How would Nathanael have understood the Lord’s response, “I saw you while you were still under the fig tree before Phillip called you.”? Sitting under a vine or fig tree was prophetic shorthand for living in peace and prosperity. The prophets spoke of a time when Israel would be free of oppressors and every man would be able to sit under his own fig tree to meditate on scripture. Over time this phrase came to be connected with the study of the Law because scholars would, in practice, often sit in the shade of a spreading fig tree to study or to hold class for their disciples. It is reasonable to surmise that Nathanael might have thought that Jesus was alluding to the fact that he was a scholar – ‘Phillip must have told him that I am a student of the Torah’. If this is so then why did he respond so unexpectedly? Jesus was no doubt exercising what we would now call a ‘gift of knowledge’. Nathanael was most likely actually sitting under a fig tree reading a prophetic scroll. But even here his thought process would have been typically intellectual – ‘Phillip knows I sit here every morning at this time to study the scriptures so he probably told Jesus this before he left to call me.’ So why did Nathanial react as he did?